75% of playground injuries are caused by falls and of that, most are caused by falls to the surface. Installing and maintaining an appropriate surface under playground equipment is probably the single most important thing one can do to keep a playground as safe as possible. Surfacing material comes in either as "loose material" or as a "unitary synthetic" material. 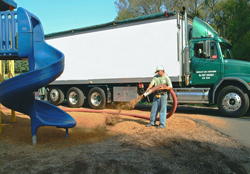 Examples of organic loose materials are wood chips, bark mulch or engineered wood fiber. Inorganic loose materials are sand and pea stone. Unitary synthetic materials are rubber mats or poured in place rubber. Loose synthetic material known as shredded rubber is also available. Surfacing Guidelines are provided by the US Consumer Product Safety Commission. The recommended depth of surface material is related to the fall height of the equipment. The standards for surfacing testing are provided by the American Society for Testing and Materials (ASTM). Surfacing materials are intended to absorb impact and minimize the severity of injuries. Head impact injuries are the most severe so the criteria for impact absorption is written to relate to this type of injury. The American's with Disabilities Act requires that playground surfacing on Public Playgrounds be "firm, stable and slip resistant." Unitary materials generally cost more than organic or inorganic loose materials but the long term maintenance cost is less. Having appropriate surfacing materials will decrease the likelihood of severe injuries. However, the Consumer Product Safety Commission notes that "...it should be recognized that some injuries from falls will occur no matter what playground surfacing material is used." To learn more about the type of surfacing that is appropriate for your playground, contact Playground Medic for more information and pricing.